A dental crown is a tooth-shaped "cap" that is placed over a tooth to restore its shape and size, strength or to improve its appearance. 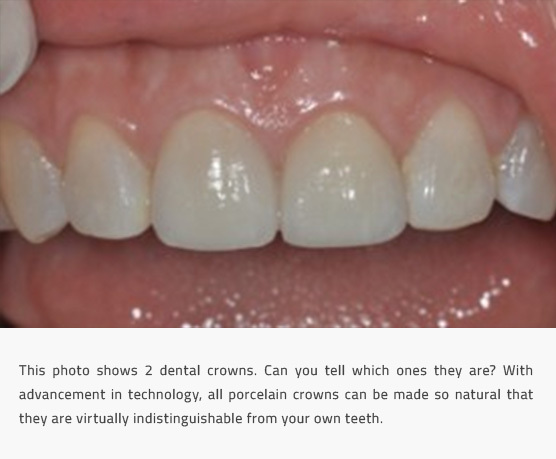 Crowns preserve the functionality of damaged teeth. If your tooth has undergone significant decay and there is not enough tooth structure remaining to support a filling. For a weak tooth or one with a large filling, a crown will protect the tooth and prevent any further chipping or cracking. Because of the heavy chewing forces placed on the back teeth, the addition of a crown is often a preferred course of treatment to a large filling. The crowns may be made completely of porcelain, porcelain fused to metal or even gold. The false tooth is known as a pontic and is fused in between two crowns that serve as anchors by attaching to the teeth on each side of the false tooth and thereby bridging them together. These are opted for when the gap to be filled is in between the front teeth and when the adjacent teeth on either side of the missing tooth are strong and healthy without large fillings. The false tooth is made of porcelain and is fused to metal “wings” that are bonded to the adjacent teeth using resin that is hidden from view.